Paul D. Fregia (free-JAY), Grandma Maud’s Founder and President, grew up in the South, where he learned to appreciate the wonderful food his maternal grandmother Maud simmered, stirred and served from her kitchen. He began Grandma Maud’s, Inc. as a tribute to her memory. Paul’s fondness for southern-style comfort food has helped drive the authentic flavors and convenient preparation Grandma Maud’s is famous for. Before establishing Grandma Maud’s, Inc., Paul gained a decade of food industry expertise as a Vice President of a national supplier to McDonald’s. Additionally, he has held management positions with Container Corporation and Hewlett-Packard. He boasts numerous achievements in manufacturing, engineering, information systems and finance. Paul also served as business confidant to Tiger Woods and his family for over five years. As an original member of “Team Tiger,” he was responsible for helping to orchestrate the transformation of the young phenom into a professional golfer. He acted as agent on the best seller “Training a Tiger” by Earl Woods, and was the founding Executive Director of the Tiger Woods Foundation. Paul D. Fregia holds a degree in Electrical Engineering from Lamar University and a MBA from the Krannert Graduate School of Management at Purdue University. 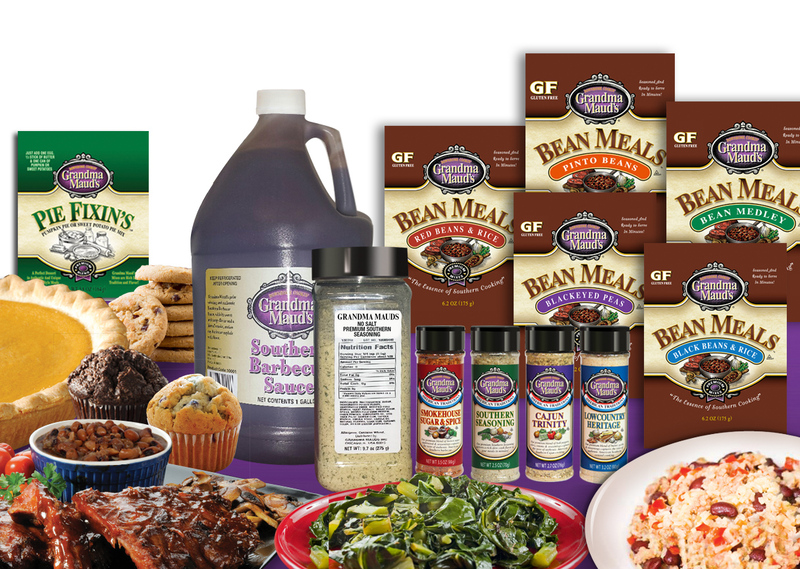 From the simmered-all-day taste of our southern-styled beans, to the slow-cooked taste of our Southern Seasoning, Grandma Maud’s brings traditional southern cooking to your kitchen. We have compiled some tried and true southern recipes such as black eye pea soup and have added some new modern recipes that are sure to become your families next set of favorites. Grandma Maud’s also offers a range of delicious items for foodservice operators, from home-style cookies and muffins, to specialty seasonings. So why don’t you pull up a seat, grab a biscuit and soak up the down home flavors that Grandma Maud’s can bring to your table. Authentic taste and modern convenience is always a-cookin’. wholesale customers some down home cookin’ products for your home or business.